Eclipses blocking the light from distant star PDS 110 may be caused by a ringed gas planet orbiting it. The rings of the possible planet are many times larger than the rings of Saturn. 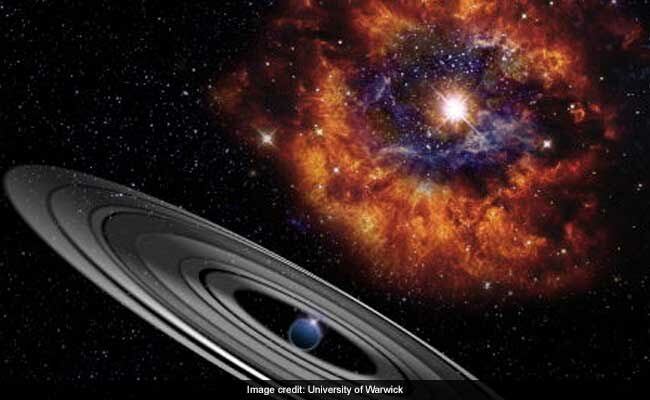 London: Scientists have found evidence of a giant ringed gas planet which may be up to fifty times more massive than Jupiter, orbiting a star over thousand light years away from Earth. Researchers had earlier identified that the light from the rare young star is regularly blocked by a large object. They now predict that these eclipses are caused by the orbit of the yet undiscovered giant planet. Using data from the Wide Angle Search for Planets (WASP) and Kilodegree Extremely Little Telescope (KELT), researchers including those from Harvard University in the US, analysed fifteen years of the star's activity. "We found a hint that this was an interesting object in data from the WASP survey," said Hugh Osborn, from the University of Warwick in the UK, who discovered the unusual light curve. "It wasn't until we found a second, almost identical eclipse in the KELT survey data that we knew we had something special," said Mr Osborn. They discovered that every two and a half years, the light from the distant star PDS 110 is reduced to thirty per cent for about two to three weeks. "What's exciting is that during both eclipses we see the light from the star change rapidly, and that suggests that there are rings in the eclipsing object, but these rings are many times larger than the rings around Saturn," said Matthew Kenworthy, astronomer at the Leiden Observatory in the Netherlands. The next eclipse is predicted to take place in September this year. Gathering new data will help ascertain precisely what is causing the mysterious eclipses. "September's eclipse will let us study the intricate structure around PDS 110 in detail for the first time, and hopefully prove that what we are seeing is a giant exoplanet and its moons in the process of formation," said Mr Osborn. The researchers suggest that there are moons that could be forming in the habitable zone around PDS 110, pointing to the possibility that life could thrive in this system. The eclipses can also be used to discover the conditions for forming planets and their moons at an early time in the life of a star, providing a unique insight into forming processes that happened in our solar system.